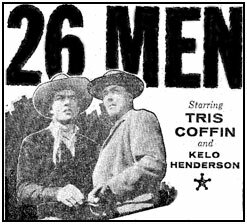 Do You Remember... "26 Men"
“26 Men” drew its title and storyline from the carefully documented exploits of the real 26 men who were Arizona Rangers, a group of volunteers founded in 1901 to enforce law in the almost lawless territory of 113,909 sq. miles. Their deeds became legendary and formed the basis of producer Russell Hayden’s series starring Tris Coffin as Ranger Captain Tom Rynning and 33 year old Kelo Henderson as Ranger Clint Travis. At the time Hayden stated, “We’re striving for authenticity and I think we’re getting it. 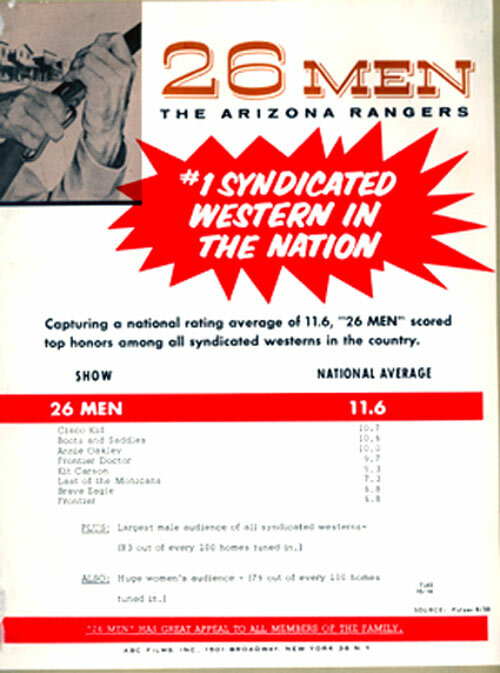 Our whole series is being shot in the same region where the real Rangers once rode.” Lending an air of authenticity to the series was its unique use of introductions to various episodes by four still-living former Arizona Rangers, Clarence Beaty, Joe Pearce, W. Oliver Parmer and John Redmond, certifying the tales as true. The extremely popular b/w half-hour series, syndicated by ABC Film Syndication, originally ran two seasons, 78 episodes, from October 15, 1957, to June 30, 1959. 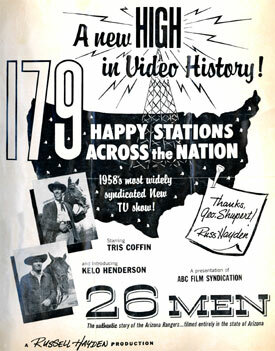 “26 Men” was 1958’s most widely syndicated new show with 189 stations, as well as Japan, England, Germany, Spain and Canada. Syndicated reruns continued to be shown for years afterward. 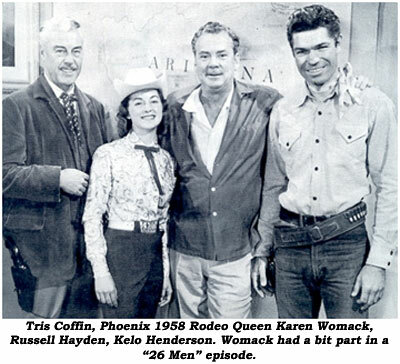 At 47, producer Russell Hayden had quite a history with westerns—from Hopalong Cassidy’s sidekick Lucky to his own starring westerns at Columbia and Universal, then six with Jimmy Ellison at Lippert followed by his “Cowboy G-Men” TV series (‘52-‘53). Turning to producing, he filmed “Judge Roy Bean” (‘55-‘56) on his own ranch in Pioneertown, CA, occasionally co-starring with Edgar Buchanan and Jack Buetel. While waiting for the series to begin filming, Kelo worked on “Cheyenne”, “Sgt. Preston” and other TVers and several films including “Last Stagecoach West”, “Saddle the Wind” and “Gun Glory”. 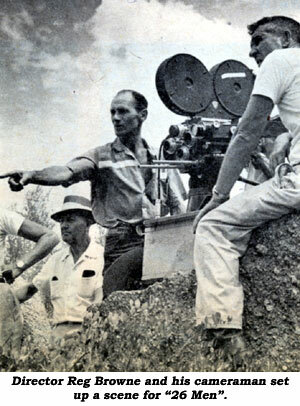 Although the pilot was filmed in Jan. ‘57 in Placerita Canyon, CA, the series then moved to Cudia City Studios in Phoenix, AZ, owned by Salavatore P. B. Cudia, then in his 70s, who had been active in the film business since 1903. Cudia owned the studio at 40th and East Camelback Rd. at the Arizona Canal. (Some episodes of “Wanted Dead Or Alive” were also lensed there.) Incidentally, the outside of Ranger HQ was actually the Cudia City restaurant. You can usually spot the Superstition Mountains in the background. For the series some lesser use was made of Old Tucson; an Indian Mission outside Phoenix; Sedona; and the Governor’s Palace. According to Hayden, each episode of “26 Men” cost about $25,000, half of what the cost would be in California. One of Kelo’s favorite guest stars was Penny Edwards, “When you did a scene with her and she was your girlfriend, she really made you believe it. (Chuckles) You had no doubts about it. As for male actors, I worked with two of the future ‘Star Trek’ fellows—Leonard Nimoy and DeForest Kelley.” Other actors familiar to westerns to be found in the casts are Don Haggerty, Roy Barcroft, Gregg Palmer, Lane Bradford (considered himself for the role of Capt. Rynning), Gregg Barton, Lyn Thomas, Elaine Riley, Tom Monroe, Bobby Blake, Stan Jolley, Bill Henry, Lash LaRue, Greg Walcott, Harry Lauter, Pierce Lyden, George Keymas, Robert Lowery, Gary Gray, Myron Healey, Leo Gordon, Morris Ankrum, Wendy Wilde, Grant Withers, Chuck Courtney and others. Two episodes were made as pilots for series that never materialized. 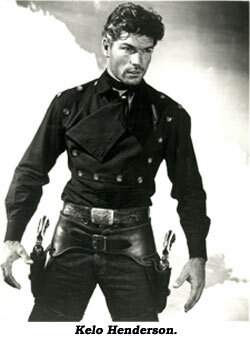 “The Tiger” was based on Mexican Rurale leader Col. Kosterlitzky, actually a former Russian Cossack. Kelo and Tris would have had recurring roles had this planned series developed. 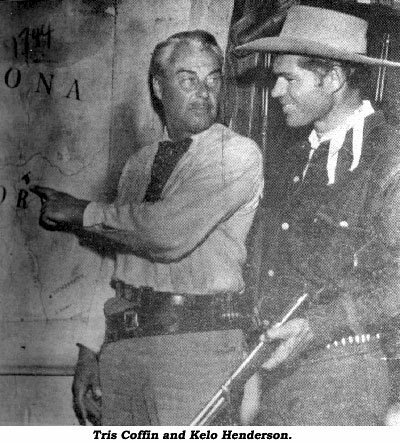 “Tumbleweed Ranger” was made as a pilot for stuntman Tap Canutt, son of Yakima Canutt. 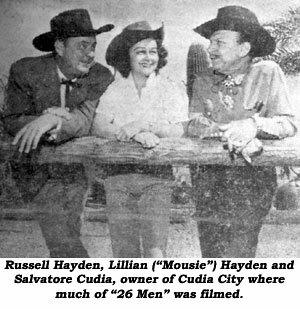 With the cessation of “26 Men”, Hayden was nearly through with filmmaking, although a few episodes of CNP’s “Pony Express” were produced at Cudia City in ‘60 in association with Hayden’s production company. Other than that, and a couple of practically unheard of non-western independents produced in the early ‘60s, Hayden retired to his Pioneertown ranch. Tris Coffin continued to work up until ‘71. At 80, he died of cardiac arrest and lung cancer March 26, 1990, in Santa Monica, CA.